Happy Monday friends! I’m so excited to be sharing this Easy Vegan Green Bean Casserole with you today – our favourite classic green bean casserole with a healthy vegan, dairy-free twist!! It’s the perfect addition to your Thanksgiving or Christmas dinner table, and it’s made FROM SCRATCH with no cream soup!! 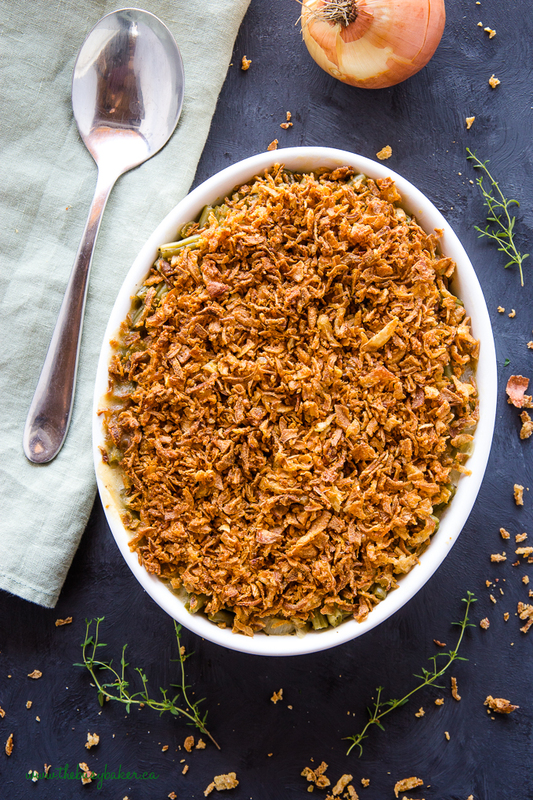 The holiday season is the perfect time for fall comfort food dishes like this Easy Vegan Green Bean Casserole, but attending holiday family feasts can be really difficult if you’re following any kind of special diet or deal with food allergies. 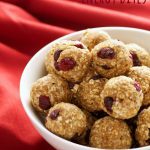 Almost all the classic holiday dishes are laden with all kinds of food allergens and animal products so I’m always trying to come up with ways to re-create my husband’s favourite holiday dishes, minus the dairy (he has a dairy allergy). 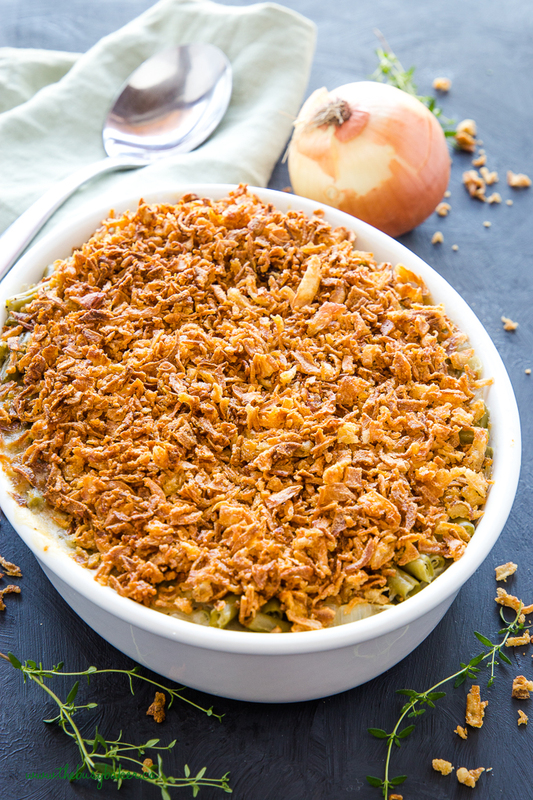 Our favourite ingredient to make dishes like this Easy Vegan Green Bean Casserole dairy-free (and vegan) is the oat cream from Oatly brand (not sponsored, just sharing a product we love!). I’m a purist when in comes to dairy and most dairy-free milk products taste awful to me. 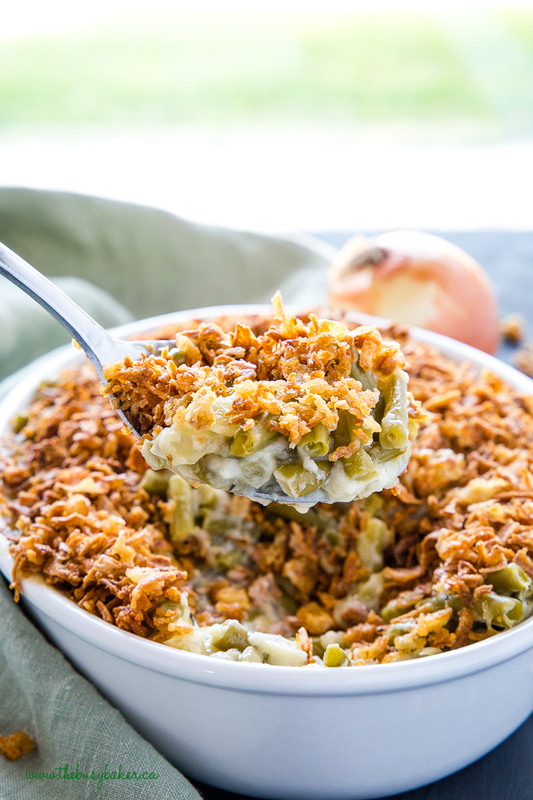 Our favourite Oatly Oat Cream behaves just like half and half in recipes and when added to sauces, like in this Vegan Green Bean Casserole, tastes just like real dairy! It contains only unsaturated fat, making it a much healthier and cholesterol-friendly ingredient than dairy cream. 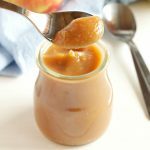 It’s become one of my favourite ingredients, and I know you’ll love it too! 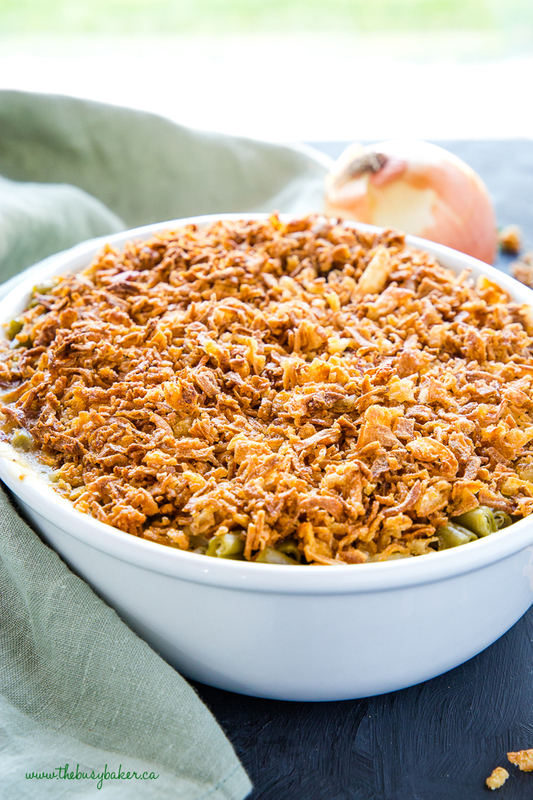 I hope you love this Easy Vegan Green Bean Casserole as much as we do! Let me know in the comments below, what’s your favourite healthy holiday side dish? I’d love to know!! 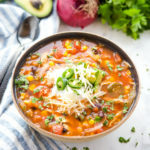 I love this recipe thank you for sharing !! 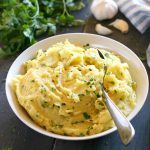 Such a delicious classic and this vegan version is really helpful! I love casseroles! And this one looks like the perfect side dish for Sunday dinners! This looks amazing! A must-make for Thanksgiving! Thanks so much! We agree! Where can I find oat cream and crispy onions? The crispy onions are available at most grocery stores (try the French’s brand), and oat cream should be available at any health food store or grocery store that carries organic items (Superstore should have both). Good luck! I LOVE this! It looks incredibly delicious!! What a great holiday side dish! I bet most of us wouldn’t be able to taste the difference with the vegan twist. making this today cant wait! 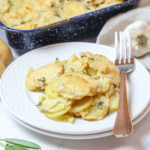 to make it gluten free can I use chickpea flour or would it change flavor too much? thanks! I have never done this, so I can’t say exactly, but it’s worth a try! Love to see Vegan options of popular holiday dishes! I am so excited to have a dairy option for this casserole. This is going on the menu this week! This looks absolutely DELICIOUS! 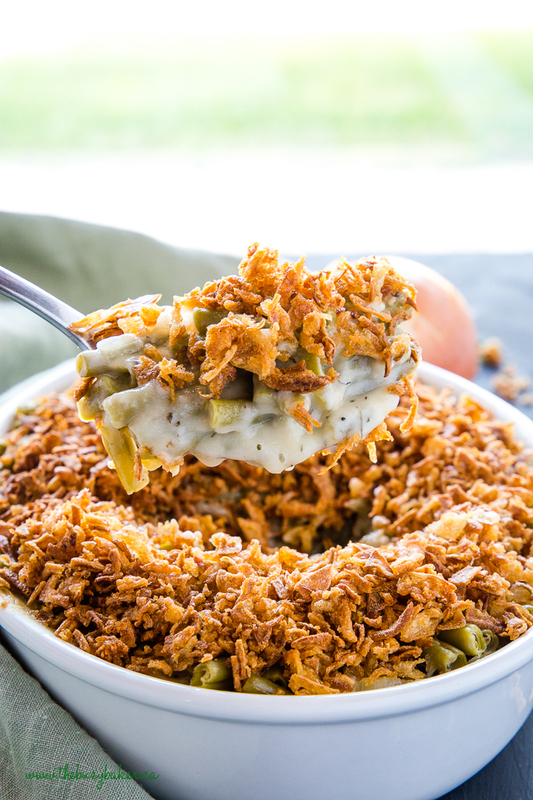 Not your average green bean casserole! Oh! I want to dig in so badly! 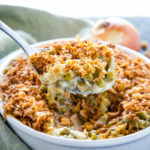 I love this casserole and could eat it all year! Love that it’s a vegan version, too! This looks spectacular! I love all the flavors going on and really can’t wait to try it, so impressive and definitely delicious! One of my favorites for the holidays! Yum! My family cannot get enough of this meal!! This casserole sounds so delicious and I’m definitely going to try it! I’m not a vegan but this looks delicious! I’m going to have to try this. Get in my belly! This looks so good. This is one of my favorite holiday sides! Love the vegan option!